I’ve set myself the goal of reading and reviewing 52 new non-fiction books in 2017. 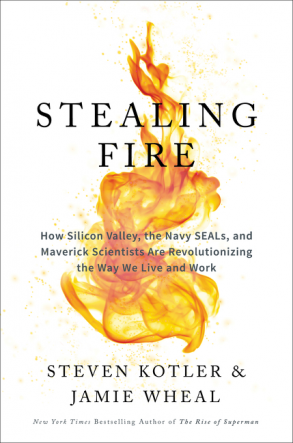 Book number eleven was Stealing Fire: How Silicon Valley, the Navy SEALs, and Maverick Scientists Are Revolutionizing the Way We Live and Work, by Steven Kotler & Jamie Wheal. As a fan of Kotler’s work, I pre-ordered this the minute I heard about it, snapping it up as the Kindle edition for the bargain price of 99p. This is a book all about ‘ecstasis’; their term borrowed from the Ancient Greek ἔκστασις, “to be or stand outside oneself, a removal to elsewhere” from ek- “out,” and stasis “a stand, or a standoff of forces”) is a term used in Ancient Greek, Christian and Existential philosophy. It’s slightly different from ‘flow’, the subject of Kotler’s earlier book The Rise of Superman, but there’s a great deal of similarity. Before reading, I was slightly sceptical it might focus too much on the pharmaceutical approach to finding ecstasis, which seems to have become trendy amongst Silicon Valley influencers in recent years. Whilst the ‘take drugs, get high’ approach to ecstasis is covered, the conclusion to the book uses a simple equation to put this in context regarding the time needed to achieve ecstasis with the risks and rewards involved. The final characteristic of ecstasis is “richness,” a reference to the vivid, detailed, and revealing nature of non-ordinary states. Umwelt is the technical term for the sliver of the data stream that we normally apprehend. It’s the reality our senses can perceive. When deeply religious subjects view sacred iconography or reflect on their notion of God, brain scans reveal hyperactivity in the caudate nucleus, a part of the pleasure system that correlates with feelings of joy, love, and serenity. But Lindstrom and Calvert found that this same brain region lights up when subjects view images associated with strong brands like Ferrari or Apple. If “focus-group politics” leaves us with a bad taste, how will “biofeedback politics” go down? This leaves us with four rules of thumb to carry into our exploration of these states. It’s not about you and it’s not about now help us balance ego inflation and time distortion. While don’t become a bliss junky and don’t dive too deep ensure that we don’t get seduced by the sensations and information that arise in altered states. In this equation, Time refers to the learning curve, or how long you need to invest in a particular technique until it can reliably produce the experience of STER. Reward refers to how well we retain the insights that arise and how consistently they drive positive change. Risk refers to the potential dangers. Hedonic calendaring provides a way to hack the ecstatic path without coming undone. It gives us a method to integrate hard-and-fast approaches like extreme skiing and psychedelics with slow and steady paths like meditation and yoga. By balancing inebriated abandon with monklike sobriety, ribald sexuality with introspective celibacy, and extreme risk-taking with cozy domesticity, you’ll create more contrast and spot patterns sooner. The Japanese get at this same idea with the concept of wabi sabi — or the ability to find beauty in imperfection. If a vase is accidentally broken, for example, they don’t throw the pieces away or try to patch it up to hide the accident. Instead, they take golden glue and painstakingly reassemble the vessel, so its unique flaws make the piece more beautiful. Book review #10 — Messy: How to Be Creative and Resilient in a Tidy-Minded World, by Tim Harford. Podcaster, author & columnist, Chartered Financial Planner & Accredited Later Life Adviser @informedchoice, chairman of Knowle Park Trust, ultra runner.